This book is a novel constructed out of six different stories. In the 19th Century a lawyer encounters savagery and civillisation in unexpected places as he sails across the Pacific. In 1930s Belgium a troubled young English musician accepts a job assisting an aging composer. In 1970s California an investigative reporter stumbles across a conspiracy at a nuclear power plant. In the early 21st Century a vanity publisher goes on the run from the relatives of his murderous bestselling author. In the futuristic state of Nea So Corpos an artificially born waitress begins to awaken to the reality of the world around her. In a post-apocalyptic Hawaii a young tribesman warily helps a woman visiting from a more advanced civilisation. 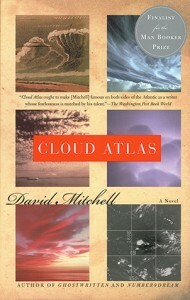 Cloud Atlas is a very ambitious book. Constructing a coherent novel out of six largely unconnected stories would be ambitious by itself, but it’s even more ambitious to have those stories be in different genres (historical fiction, pulp thriller, cyberpunk, post-apocalyptic) and written in six different distinctive writing styles. To have any one of those stories be weak or to have any of them failing to fit in with the others could have brought the entire novel down, and while I don’t think the book is perfect I think all the different stories are at least good and in most cases very good. At the halfway point of the novel I was a little bit dubious about whether the different stories were fitting together in such a way that the whole was greater than the sum of its parts, but I think the second half of the novel does a great job of tying them together. Despite being very different in terms of the writing and the plots I think thematically the stories are consistent with each other, although in some of the stories the themes are expressed more subtly than in others. Occasionally the exploration of the themes does feel a little bit heavy-handed, I think in some circumstances it is reasonable to have the characters musing on the themes of the story (it is the sort of thing Adam Ewing might write about in his journal), but occasionally it does feel a bit unsubtle, for example when Isaac Sachs is jotting down notes about the past and future. I think the differences in tone and writing style between the different stories does add something to the overall novel, although Timothy Cavendish’s story is a bit lightweight in comparison to some of the others it is a bit refreshing to have an entertaining caper to contrast with the often tragic events in some of the other stories. Looking at the basic premise of many of the stories it could easily have been a gloomy and pessimistic novel, but although a lot of bad things happen one consistent theme is that as long as some people try to make the world a better place there is still some hope for improvement, the darkest ending to any of the stories comes from the one where the main character in it has given up on hoping for things to get better. The characterisation is strong throughout the novel, particularly of the six main characters although there are a number of memorable supporting characters as well. Sometimes the characters are not particularly likeable, but I thought they were all very believable characters. Since five of the stories are narrated by their protagonists the different ways in which those stories are written does reflect a lot about what they characters are like and how they choose to describe events can tell us as much about them as the events themselves, for example Adam Ewing’s naïve blindness to what is going on around him, Robert Frobisher’s increasingly troubled letters or the way that Sonmi~451 has realised the power of the very human act of storytelling. I think the universal instinct to tell stories and how the storyteller can shape the story they are telling both consciously and unconsciously is another one of the main themes of the novel. I thought the most powerful of the stories were probably “Sloosha’s Crossin’ and Ev’rythin’ After” and “An Orison of Sonmi~451”, although the writing might be at its best in “Letters From Zedelghem”. “Half Lives” and “The Ghastly Ordeal of Timothy Cavendish” have a bit less depth than some of the others but they are still entertaining. “The Pacific Journal of Adam Ewing” supplies a good beginning and ending to the novel. One thing I’m not completely sure about is whether the idea of characters throughout the six stories being in some way reincarnations of each other was just a gimmick or whether it really added anything to the overall novel, I suspect the book wouldn’t have been weakened much if that idea had been taken out. Overall, I would say this is a very good book. The second half is probably better than the first since the first half does have to go through the lengthy process of introducing six different stories. It sets ambitious goals for itself and I think it probably meets most of them.